A great evil sweeps across the realm, and young swordsman Roan, joined by his companion, Yufa, must face it head on! The path they travel is rife with danger, as well as an ever-growing cast of heroes. Adventure awaits and the journey starts now! On the surface Miki is just an attractive girl from neighborhood, working hard at her mother's ramen shop. But look closer, and you'll find that she's a crazed psychopathic monster with the strength of an ox and attention deficit disorder. This, predictably, leads to battles for supremacy with other evil neighborhood vendors. Kate, Claire, Rose, and Rachel once explored the streets of New York with the promise of limitless futures unfolding before them. But now, murdered and resurrected as killers, they must silence demonic beasts no ordinary weapon can destroy – or risk losing what remains of their so-called lives. 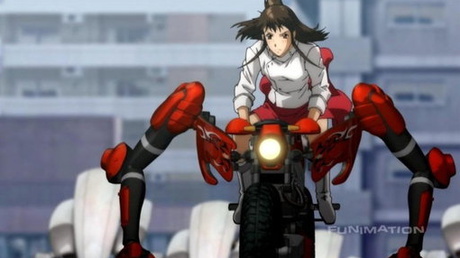 Atop her robotic RideBack motorcycle, an ex-dancer named Rin ignites the fires of rebellion in a nation held captive by its own oppressive government. As Juliet prepares to raise her sword against the tyrant whose hands are stained by the blood of her ancestors, only Romeo stands in her way – the boy she loves and the son of the man she must kill. Friendship and faith, love and betrayal... And guilt. Rumbling Hearts weaves a tale not of superheroes or science fiction, but of the silent sufferings of any potential passerby. This is real life. Happy endings are bittersweet at best. Meet four fast high school friends – Haruka, Takayuki, Mitsuki and Shinji. Life’s promise shines brightly on these companions, until one day a random accident leaves Haruka in a coma. Her boyfriend, Takayuki, cannot forgive himself and seems determined to follow Haruka into a comatose state. Mitsuki dedicates her life to taking care of this tragic young man, and the pair salvage what they can, falling into a self-destructive relationship floundering in guilt. When Haruka awakens three years too late suffering from anterograde amnesia, everyone has to act as if not a day has passed. Torn between his unhappy real-life train wreck with Mitsuki and the warm and fuzzy daydream high school romance with Haruka, Takayuki watches what little silver lining was left in life be mercilessly and methodically stripped away.